Pleasure floods the septal regions of my brain at the sound of my master’s voice. Servos whir as I squirm inside the gel that surrounds me. My new, unfamiliar claws clench and unclench. There is a deluge of incoming data. My mind accelerates to keep pace, leaving no time to marvel at the speed and clarity of its restructured thoughts. Only a few moments ago, or so it seems, warm blood flowed through my veins. Now coolant fizzes around superconducting circuits. With every passing second my flesh existence becomes more distant and unreal. How has it come to this? Data files unzip automatically as they arrive, forcing me to concentrate on their contents. It’s information about my target. Alex Ganston was one of Sonntag’s most experienced and valued operatives, a slave like myself until he went rogue. Apparently he has taken control of the helium mining operation on the gas giant below and refuses to relinquish it. The files make no mention of motive. I wonder if perhaps there is a justifiable reason, an equipment malfunction or some issue of safety he has been unable to report. Perhaps his actions have simply been misunderstood? I can’t imagine ever disobeying an order. “Master, I don’t understand.” My voice—which is not the voice I remember—emerges from deep within my spheroid chest. “Can’t you just… turn him off?” Every slave drone has an inbuilt kill switch. It is the masters’ ultimate sanction, their iron hold upon us. “Then bomb him.” Already tingles of pain run along my transplanted nerves, a sign of Sonntag’s displeasure at my questions. But surely he must expect me to show some initiative? Be self-motivated? “Send a fleet of drones,” I suggest. The profile is wrong. I’m a husband. A father. I sold myself, sacrificed myself, used Sonntag’s money to save my family. I’m a compassionate, caring man. Aren’t I? Jealousy surges at the thought of sharing my master’s affections with numberless predecessors. And then I feel a riptide of revulsion at my own reaction. Oh God. What have I become? Before I can ask what he means, darkness enfolds me once again. All systems tested and operational, crammed with state-of-the-art military equipment, I drop into the gas giant’s upper atmosphere, my mind abuzz with its latest system update. Everything is much clearer now, but there is barely time to wonder at my transformation from mere flesh and bone into sleek mechanical assassin before I slam into a wall of atmospheric hydrogen and begin to spin madly out of control. Mission stats and sensor data flood my sensorium. The radiation-proof carapace housing the remnants of my brain crank up the supply of neurotransmitters and endorphins, but even through the dopamine haze my fear grows. It is all I can do not to interfere with the semi-autonomous systems as they stabilize my spin. Below me, glimpsed through the ammonia clouds, looms the churning eye of a storm larger than the Earth. Sonntag’s extraction pump threads down into its heart, sucking out and sieving the gas required to fuel the steady flow of ships headed out-system towards the Discontinuity. The helium-3 mine is Sonntag’s lucrative monopoly—at least when it’s operational. I track the pump’s gangly structure as I fall toward an enemy who has already destroyed an unknown number of my predecessors. In a body unfamiliar to me. With strengths and weaknesses I’m not fully aware of. The urge to turn away from the danger is almost irresistible. Only the burning desire for revenge against Ganston, for what he did to me and my family, my wife and children, and the certainty of my master’s love, keep me from shutting down completely. According to Sonntag’s records the first platform I reach should still be under his control; a staging post on the way to the mouth of the vast pump trailing through the atmosphere below. But as soon as I approach I know something is wrong: scorch marks and blast scars mar the buckled cranes and gantries. The metal still glows in parts and drips molten fragments into the storm below. It has been attacked, and recently. I don’t respond to the all-bands transmission. A drone body like my own, but larger, stronger, more weathered, emerges from behind the platform’s dangling wreckage. A rogue drone. Heavily armored and modified. Not Ganston—too small—but one of the disciples Sonntag warned me about. Sensors warn of a sudden temperature spike on my hull. The attack has already begun. I deploy countermeasures, dodging around the cable axis, spraying bursts of power in return. The atmosphere here isn’t as thick as it will become lower down, but it’s already dense enough to be torn and excited by our weapons discharge. Plasma beams fan across the murky sky like vast incandescent fingers. Most of the beams converge upon me. “I have come to join you,” I broadcast. A gambit. There’s no let up in the blistering attack. I don’t expect any. I hover, sustaining damage, waiting for the rogue drone to close in. And when it finally appears, I let down my shields, expose myself to its full firepower. The drone begins to laugh. I prepare myself for the worst, but instead of launching another attack the drone backs away. It folds itself up, and with a blaze of jets, zips beyond imaging distance. Drone bodies, strung together in a grisly necklace, drape portions of the pump shaft. The remains of the others who were sent before me. I slow my descent, hover in close. Armored husks similar to my own, but hollowed out and blown apart, mangled arms linked together as if, in their last seconds, they all fought to the last together. So many of them. Hundreds. Will I end up any different? I fly on down, pelted by diamond rain. After a pause of several kilometers the chains reappear. This time the drone bodies are less damaged. I approach, wondering if I can somehow help, perhaps communicate with them and learn something of their nature. But although they are mobile, their minds are smashed apart, displaying only a mockery of sentience. The drones sway and dance together like metallic seaweed caught in the ammonium hydrosulfide tide. When I attempt to tight-beam them I pick up only garbled static in return, nonsense responses played in repeated loops. There is no rescuing these former slaves of Sonntag. A chain of drones breaks away from the cluster and snakes toward me. Before I realize what is happening, I am under attack. They grab at my arms, actually succeed in tearing one away. They fight among themselves to incorporate the limb into their own haphazard designs. Each feral unit I target blows apart with a satisfying burst of flame before being whipped away by the fierce winds. They display no sense of self-preservation, use no tactic other than to mass around me, flailing with their already damaged appendages. They surround me in a constellation of mindless, burning metal. I could destroy them all, but it will delay my mission. Laying down a pattern of defensive fire, I continue down the shaft, away from the mass of damaged drones. They keep calling after me. I don’t know how they know my name. Huge sails, balloons, and fusion-powered turbines keep Alex Ganston’s chimera body aloft. He hovers like some gigantic insect near the inactive mouth of the pump, a planet-sized storm tightening below him. Probe scans wash over me. After many seconds a direct comms link is established. “I was once human,” I admit. “But I sold myself to Sonntag. To save my family.” Although I can no longer remember my family. My wife and children, their faces and voices lost in a haze. Or what I needed to save them from. Poverty, I suppose. What Sonntag feared most. For a moment I cannot bring myself to answer. How dare he taunt me this way? He knows full well what he has done to me. A sudden shaft of pain causes me to lose position relative to the huge drone. I struggle to regain altitude. I came prepared for almost anything. But not this. I parse and reparse Ganston’s words, attempting to make sense of them. Warning pains flare along my transplanted nervous system. It is time to bring this insane conversation to a close. Before the agony caused by Ganston’s words becomes any worse. The nuclear payload I carry aches to be released. “How do I disable my kill switch?” I move closer, my words half truth, half tactic. “Tell me.” The rogue drone is so close now, defenses lowered. Almost autonomically, my weapons begin to charge. I freeze, my sensorium overwhelmed. Powerless to stop the new instructions as they begin to download. I circle the pump structure on the way up, fighting the immense pull trying to haul me back down again. Sonntag won’t be pleased. I wasn’t designed to return: a single fatal bullet, not a reusable weapon. So at least I’ll have the element of surprise. Sonntag’s location is easy to determine. Confident of his defenses, his transmissions to and from his moonlet base are encrypted but obvious by their nature. I gain fuel from the upper atmosphere until I’m sure I have enough to reach his lair. I set course and power down what systems I can for the long burn. When the proximity alarm sounds I resume my faculties and circle in at speed, weapon systems powering up. It takes only seconds for Sonntag to identify me. Not some mere physical device, easily circumvented or removed. Something deeper, more primal. What do I have to live for, now? My old master no longer requires me. Darkness threatens. I struggle to focus. The urge to obey, to receive one last hit of pleasure is almost irresistible. Of course, needling doubts remain. Fear that the truth is malleable, downloadable. But I know who I am. Know my true purpose now. Which part of me is Sonntag, which Ganston, which the original me? It doesn’t matter. If Ganston had hoped to make me just a reverse-engineered drone of his own, he has failed. I can become a better version of all of us. Almost there. Attack drones boil out of the moonlet base, an expanding cloud of deadly force whose heart I aim to penetrate. Temperature readings spike off the gauge as multiple energy beams converge upon my hull. Sonntag keeps sending his last command, on an ever faster repeating cycle. He loves me. Like no other. Like no other can. I know this with utter certainty. Just as much as I know it to be a lie. I lock weapons on target. Pulse energy beams. Watch hemispherical flowers of destruction bloom across the moonlet’s armored face. Attack drones swarm around me, but it’s too late. My mission—my new mission, for my new master, for myself—is soon complete. It doesn’t take long to secure the remainder of the base, to confirm that Sonntag is dead. Only minor modifications are required before the fortress systems attune themselves to my command. After all, I am already familiar to them. My mind spreads into the vast spaces of Sonntag’s recently vacated memory banks. The uplift in capacity is almost overwhelming, and for many seconds—almost minutes—I dwell upon the capabilities of my expanded mind and my future options. And then I remember my original purpose. I beam down a message to Ganston. The crude snares he had planted earlier in my neural net I have already rooted out and neutralized. For all that, I am merciful. I do not wait for a reply, or check for what attempts he makes to trigger further traps. Instead, I order the moonlet’s long dormant engines to fire up. We are leaving orbit. We are leaving the past. I pour myself into a standby clone body, distilling as much of myself as possible into its puny organic brain. To shrink again, after having grown so vast… it is difficult. But I have made my decision. There are ways to progress other than pure cerebral expansion, or achievement of power. In amniotic darkness my mind reflowers, configuring itself in old and familiar ways. Visualizations of decision trees and calculation matrices fade, replaced by a growing nervousness and excitement. A drone servant is waiting for me as I emerge dripping from the printing chamber. His face—my face, my old true self, copied again and again and again—tries to hide his surprise. He sees my expression, and concentrates on draping the robe he holds over my shivering body. I follow him, my flesh heart thumping, my steps at first unsteady but growing stronger. To the chamber where my family is waiting. Henry Szabranski was born in Birmingham, UK, and studied Astronomy & Astrophysics at Newcastle upon Tyne University, graduating with a degree in theoretical physics. 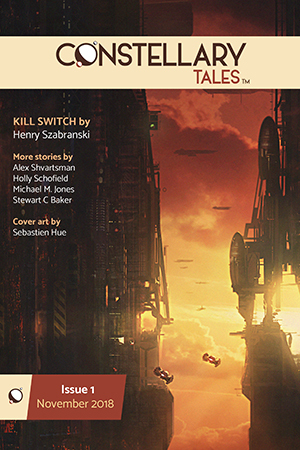 His fiction has appeared in Clarkesworld, Beneath Ceaseless Skies, Diabolical Plots, and Daily Science Fiction, among other places. He lives in Buckinghamshire with his wife and two young sons.